*Virginia McLaurin is doing the most in her second century on earth. A month before her 107th birthday in March, she cut a rug in the White House with America’s first black president, and on Thursday she followed that up by attending her very first Major League Baseball game, where she also danced her little heart out. 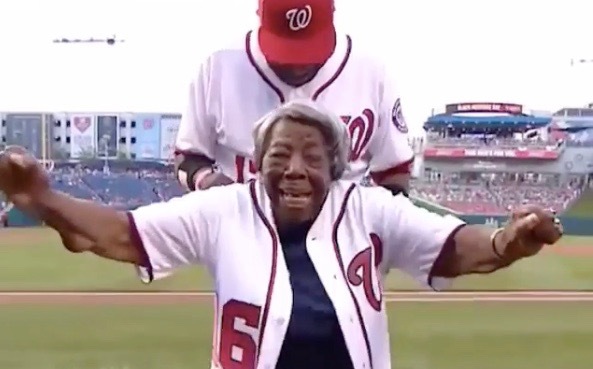 It was Black Heritage Day at Nationals Park in her native Washington D.C. McLaurin, born in 1909, was honored before the game as part of the special pregame ceremony, which included getting a personalized jersey from Washington Nationals manager Dusty Baker. Perfectly capping McLaurin’s day at the park was her hometown team’s victory over St. Louis 2-1, thanks to a sixth inning go-ahead home run from Bryce Harper, a slump-breaking 437 ft. moon shot that just so happened to hit Jackie Robinson’s name on the façade of the third deck in right field. It was Harper’s longest long ball of the season, and only two other players have ever hit it that far in Nats Park (Adam LaRoche, Adam Dunn).